James Williamson was born in Pathhead, near Kirkaldy in Scotland on 8 November 1855, and trained in London to become a master chemist. In 1886 he moved to Hove, East Sussex, with his wife and family to establish a pharmacy. For the next decade, Williamson developed a keen interest in photography and optical entertainments, and as a Kodak agent acquired a good understanding of photography's technical and chemical nature. In 1896 he introduced X-Ray photography to Sussex and in November presented the first programme of films to the Camera Club at Hove Town Hall. 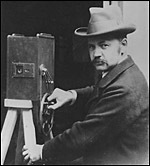 Williamson began to make films in 1897 and his first catalogue of 1899 listed sixty titles, the majority of which were single shots between sixty and seventy-five feet in length. His first edited multi-shot narrative film was Attack on a China Mission - Bluejackets to the Rescue (1900). This four-shot work of 230 feet, his longest film to date, was made in the autumn of 1900 and followed a summer of inspired film-making by G. A. Smith , his Hove friend and counterpart. It is in the context of Smith's development of English film form that Williamson conceived and executed this film, which marks his move from 'non-continuous' to 'continuous' narrative. Williamson's next significant multi-shot film was Fire! (1901), a contribution to the 'fire' drama genre apparent across the media in cinema, theatre, magic lantern lectures, and newspaper reports. Fire! , like Attack on a China Mission , reflected Williamson's understanding of the rescue narrative and his ambition to find the means to develop a more complex and arresting film structure. By designing a carefully constructed and edited five-shot work of fiction made on locations and a set with a real fire brigade's apparatus and staff, Williamson created a film that was simple in form, yet radical for its time. His subsequent social dramas and ingenious trick films, especially The Big Swallow (1901), maintained the same spirit of innovation. In 1902, Williamson's commitment to narrative fiction continued with two 'picture stories', as he referred to them, based on the experiences of soldiers returning home from South Africa. They both express an intelligence and compassion missing from most of the period's war-related films and entertainments. In The Soldier's Return (1902), a soldier back from the Boer War collects his mother from the workhouse and re-establishes their home together. This gentle five-shot, three-location, two-minute drama was partly filmed at the Brighton Workhouse. Williamson's second story of a returning soldier, A Reservist, Before the War, and After the War (1902), provides a more negative portrait of the post-war experience. In the first scene, before the war, we are introduced to a young family at home in pleasant surroundings. Following the intertitle 'After the War' we return to the same interior. But it has now undergone a tragic transformation: it is almost empty of furniture, a sick child is cradled in his mother's arms, and there is no fire in the hearth. This transition from comfort to poverty is presented as the direct result of the reservist's war service and his subsequent unemployment. The lucid and careful narrative organisation Williamson deployed in A Reservist, Before the War, and After the War is also evident in The Little Match Seller (1902), Remorse: A Tragedy in Five Acts (1903), The Old Chorister (1904), The Two Little Waifs (1905) and The £100 Reward (1908), offering proof that film drama, as opposed to a lantern drama or stage drama, could now be conceived as a distinct and viable entity. Williamson's films also illustrate the shift within film acting from pictorialism to naturalism; in all his films the acting style is restrained and conforms to the new naturalism being developed on the contemporary stage in order to interpret the works of Ibsen , Pinero and Shaw . In 1902 the Williamson Kinematograph Company opened its first purpose-built film production studio and film processing works in Hove. His family played a distinctive role in the new business by helping to create scenarios and make sets and costumes, and taking acting roles, big and small. Tom Williamson's part as the anarchic boy upsetting the pillars of society in Our New Errand Boy (1905) vividly expresses this enthusiasm for film-making and his father's provocative imagination. Williamson's dramas and comedies were sold and exhibited across Europe and America. In 1907 his son Alan opened the company's New York office and in 1909 James attended the European Convention of Film Producers and Publishers in Paris. But in that same year changes in the world film market led Williamson to withdraw from film production. In 1910 the company moved to London, where it concentrated entirely on manufacturing cameras and printers. The Williamson apparatus acquired an excellent reputation and was used throughout the world. James Williamson died of a heart attack at his home in Richmond, Surrey, on 18 August 1933. A little boy kidnapped by gypsies is rescued by a gypsy girl.